Philadelphia What comes after innovation? As CEO of Benjamin Franklin Technology Partners, an organization charged with catalyzing the Philadelphia region's entrepreneurial and innovation economy, I've struggled with this question. While driving through Washington D.C. years ago, I spotted the word "innovation" as part of a new condo development. Clearly, I thought, the concept of innovation - at least as BFTP thinks about it - was being significantly diluted. So, what comes next? What follows innovation? "Philadelphia lost its focus on impact…when companies became more global and less local, and profit and purpose became competing objectives." It was 2001 when I began to follow the emerging national narrative around impact, marked by Harvard Business Review's January 2001 issue: Ideas with Impact - an issue I still have to this day. In it, an article by Charles Handy entitled "Tocqueville Revisited: The Meaning of American Prosperity." revisits Tocqueville's journey, but focuses on capitalism instead of democracy. Handy writes of the need for "new capitalism" and discusses American Nobel Prize Winner Robert Fogel's optimism that "a new sense of purpose…will be at the heart of the next stage of capitalism." The idea resonated with me then and stayed with me over time. This call for "new capitalism" continued to unfold and evolve in the years since 2001. Yet, as I observed and actively participated, myself, in a period of discovery, I couldn't help but experience a profound sense of rediscovery...a returning to our roots. In the Philadelphia region, Ben Franklin's injunction to "do well by doing good" is in our DNA. As I've learned time and again, the history of our city is replete with examples of ‘impact.' Stories like that of the John B. Stetson Company, dating back to 1865, who set up shop to manufacture hats but understood that addressing the personal needs of his employees was important for him to attract and retain a labor force. Stenton created a "company town" including a wide array of employee benefits including healthcare, profit sharing, and support of community schools and other resources. It's a model that's hard to find today. Indeed, Philadelphia lost its focus on impact, as so many communities did, along the way, when companies became more global and less local, and profit and purpose became competing objectives. Recently, however, a new generation is rediscovering the core values that were present at our founding, and asking about the impact of their enterprises. At Ben Franklin, we have always looked beyond the financial prospects of a business to measure its economic impact on our region; now we wanted to look beyond the innovation, to the social impacts of an enterprise. Signaling this change, in 2014 Ben Franklin released its new messaging: "Partners with a Purpose." We've prioritized a focus on impact -- beyond innovation -- as the foundation for a different approach to our region's economic development strategy. And today, we often ask the question: What is your purpose? What is our purpose? The question isn't necessarily a simple one. Technology and business innovations are all around us, with new entrants entering the arena at a rate that challenges anyone's ability to stay apace. We are certainly innovators, but to what end? What challenges are we addressing? How can we best apply our talents and capital to tackle seemingly intractable social and economic challenges? "We are certainly innovators, but to what end? What challenges are we addressing?" In seeking an impact focus for Philadelphia's regional economic development strategy, our team imagines an approach that cuts across technologies and is sector agnostic. A method that is additive to existing strategies, asks different questions, and measures different performance indicators. Through this, we hope to attract new, private resources and create new public/private partnerships to tackle challenges that exceed the capacity of public resources alone. To begin, we started with what was directly in front of us: Ben Franklin's portfolio of emerging technology enterprises. We identified more than 100 portfolio companies that were developing products and offering solutions to address a wide range of social issues. And, importantly, the financial performance of these companies was similar to that of the entire portfolio. For many, their "purpose" was core to their value proposition and business model, yet, their pitch was primarily economic to secure investment capital. They were about building their business and describing their competitive advantage in traditional ways. The question for us: how best could we work with our companies to help them to better articulate and measure yet other competitive advantages, those that would both attract a new category of investor, the impact investor, and be an impetus for the enterprise to retain that "purpose" front and center as it grows. In 2006, Michael E. Porter and Mark R. Kramer named the challenge that Benjamin Technology Partners faced. In Harvard Business Review's Strategy and Society: The Link Between Competitive Advantage and Corporate Social Responsibility, they wrote, "The prevailing approaches to CSR are so disconnected from business [that they] obscure many of the greatest opportunities for companies to benefit society." At Ben Franklin, our friend and partner, Richard Binswanger, refers to this disconnect as "binocular thinking" - one lens for charity, another for profit, separate and distinct. "The shift from corporate social responsibility to corporate shared value pulled it all together for me." We encountered binocular thinking (versus telescope thinking) first hand in Ben Franklin's efforts to raise private capital for our work with emerging technology enterprises. As a non-profit, venture development organization, we didn't quite fit through either of the "two doors" that most institutions have…profit-making investment or charitable giving. I was perpetually in search of the elusive "third door." Ben Franklin is a hybrid. We are non-profit, but our mission calls on us to invest in private enterprises at their earliest stages, for both profit and purpose. In addition, our charter asks us to be a convener and to help catalyze new efforts that create the infrastructure for innovation that is needed for continuous and sustained growth. So, when the concept of the "fourth sector" - organizations and strategies that blend public, private, and government resources and approaches - entered the narrative via a front page article in a 2006 issue of the New York Times, I thought: that's us! But who cared or was prepared to support our strategies? In 2011, the answer began to crystallize with another HBR article from Porter and Kramer, "Creating Shared Value." The shift from corporate social responsibility to corporate shared value pulled it all together for me. This was the ‘third door'! This was the telescope! In the years that followed, Ben Franklin Technology Partners developed the theme of shared value as it could apply to a regional economic development strategy in Southeastern PA. With a team of willing partners, we engaged the Economy League of Greater Philadelphia and held listening sessions across the region in 2015. The result, documented in Growing the Impact Economy in Greater Philadelphia, was a strong, shared sense that the impact economy offered an important opportunity for our region and that investing was at the crux. This work provided the framework that led to the creation and launch of ImpactPHL, seeded with essential start-up support and working capital from Halloran Philanthropies. 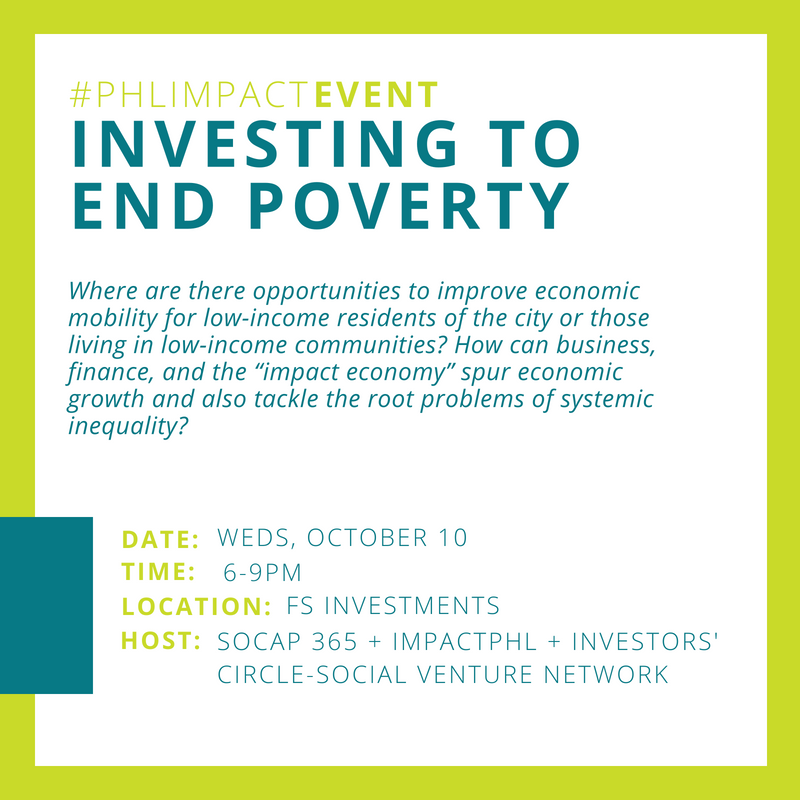 ImpactPHL was conceived as our region's impact economy catalyst, a convenor, a missionary, and front door for impact-minded interests with a goal of positioning the region as a hub of impact investment and entrepreneurship. ImpactPHL is being incubated in our offices and is preparing to spread its own wings as an independent corporation. Our impact journey is gaining momentum. Though perhaps because I am looking for it everywhere, evidence of the influence of consumers, employees, corporations, investors, and governments seeking options that capture social impact is visible daily. Purpose-driven millennials are our next largest living generation, soon to make up 75% of the workforce and receive $30T in the largest generational wealth transfer in history. Harvard Business Review's top global CEOs speak about the centrality of impact to their strategies, as corporate stock prices rise and fall with media coverage of poor cultural practices or breaches in trust. Larry Fink, CEO of BlackRock, with $6 trillion in managed assets, encouraged companies to consider the societal implications of their business, as the ESG investment market climbs to $22.8 trillion (more than one quarter of all managed assets). As primacy on impact continues to move into mainstream consciousness and behavior, the geographic regions who best understand impact will undoubtedly grow and succeed. I, and my team at Ben Franklin, believe that Philadelphia and our region is perfectly positioned to maximize this new thinking, demonstrate leadership at a critical moment in time and work across our community to pave the path for a new story of inclusive growth across sectors. Our multi-year odyssey toward impact, and the recent launch of ImpactPHL, have greatly informed Ben Franklin's future pathway. And, while "doing well by doing good" has always been at the foundation of our mission, we're now taking it to the next level. We're doing this in several core ways. First, through ImpactPHL Ventures, the product of a US EDA-funded planning grant, we have raised $15 million to be deployed to impact companies. Second, we measure our client company's key performance indicators for impact - whether it's the amount of clean energy they produce or results of diverse hiring practices. Third, we're committed to embedding impact thinking and practices throughout our entire operation. Finally, in partnership with regional collaborators, we are exploring how an impact focus can accelerate regional development and capital formation strategies. Critical to the success of any economic development strategy is the ability to attract private capital and talent. The new federal Opportunity Zone provision in the revised tax law can be a significant incentive to achieving these goals. By elevating the social benefits of economic development strategies, we believe communities can attract a growing number of investors seeking to make a difference alongside a return on their financial investment. This was a goal of our dear friend and partner, Jeremy Nowak, who was lost to all of us this summer, but whose voice will continue to be strong as the work he started and the thoughts he stimulated continue to grow and take new shape with a new convergence and alignment across the worlds of technology innovation, community impact and investment opportunities. Indeed, we have important work to do in the years and decades to come to build a thriving "impact economy" in the Philadelphia region. I am proud to say, today, that impact, beyond innovation, is happening here and is happening now. I think Ben would be proud too! RoseAnn B. Rosenthal is President, CEO and member of the Board of Directors of Ben Franklin Technology Partners of Southeastern Pennsylvania (Ben Franklin). Rosenthal has over forty-five years of experience in economic development, business investment, and regional planning. With a current portfolio of over 200 technology companies, Rosenthal has led Ben Franklin since 1996, growing its reputation and impact through innovative partnerships and a solid track record of seeding hundreds of southeastern Pennsylvania’s technology leaders across all areas of technology. Rosenthal helped design and launch the region’s Health Care Innovation Collaborative, an open innovation model unifying universities, corporations, investors, healthcare providers and insurers in development of new solutions; and catalyzed the development and launch of ImpactPHL, a regional alliance focused on growth of the Greater Philadelphia’s impact economy. Currently, Ben Franklin partners with Village Capital and UBS in Village Capital Pathways, a program providing training for African American, Latinx, and women founders on what it takes for their ventures to be competitive for early-stage investment and engagement with strategic partners. Ben Franklin also partners with the Alliance of Women Entrepreneurs on AWE Ventures—Powered by Ben Franklin, focusing capital and guidance to develop both female-founded enterprises and investors.